With the HCT Summer Championship about to begin, Shacknews has certain cards that viewers should be on the lookout for. The Hearthstone Summer Championship weekend is set to begin on Friday morning, with 16 players (four from four different regions) competing for a share of the $250,000 prize pool. With so much at stake, the competitors are all bringing their best decks forward. Shacknews is in attendance at the Blizzard Arena and before the action gets underway, there are a couple of out-of-the-ordinary deck that players should be on the lookout for throughout the weekend. Hey, why does this card look familiar? "The princes are duds. Nobody should be playing these guys under any circumstances. Not with so many useful early play cards out there." Oh… right. So I'm an idiot. That shouldn't be breaking news to anyone, right? 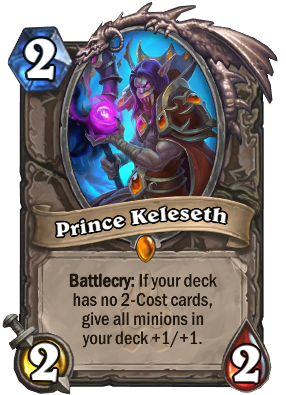 So all hail everyone's new overlord, Prince Keleseth! He sure looked like a dud on paper, but then Japanese competitor GundamFlame learned that the Prince's effect can be abused heavily in Rogue decks. In essence, the Prince's effect offer a Grimy Goon-style +1/+1 effect across every card in a player's deck. But using Shadowstep, the Prince can be played repeatedly, making him deadly in a Pirate deck. Ten players will utilize the Prince Rogue deck that has taken the meta by storm, but the Prince has also found a home in Aggro Zoolock decks. Japan's uya and China's BaiZe are among the players packing Kelesith Zoolock decks, but the most intriguing deck belongs to Korea's cocosasa, who brings along an Aggro Paladin built around the Prince. It uses Keleseth as a table-setter for a deck filled with 1 and 2-cost minions, with Sunkeeper Tarim on hold as a win condition. Keleseth will have a lofty presence this weekend. It'll be interesting to see if his presence in the current meta leads to success in tournament play. 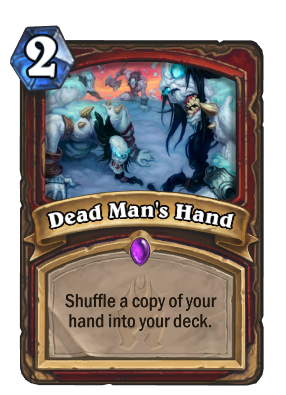 Control Warrior has largely gone the way of the dinosaur, but Dead Man's Hand has given this deck type new life. It essentially makes the Warrior mill-proof, allowing him to constantly replenish his hand. It also means an endless supply of control spells, with Execute, Sleep with the Fishes, and Brawl constantly in-hand. China's Trunks will be the only player packing two Dead Man's Hand spells, which ensures a bottomless deck. Ukranian player OldBoy will roll the dice by only packing a single copy of Dead Man's Hand. The hope will be that N'Zoth, the Corruptor can end the game before reaching any kind of fatigue state. Deathstalker Rexxar placed squarely in the middle of Shacknews' recent Death Knight rankings. The reasoning was mainly that Rexxar's Hero Power allowed for infinite resources and also, depending on the type of Beast that pops up, could also fit into some game-saving situations. For example, I've previously expressed my endless love for the Exploding Bloatbat/Stubborn Gastropod combo. 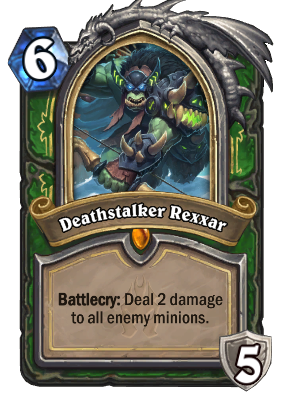 The trouble, as is often the case, is getting to Deathstalker Rexxar and it's enough of a gamble that only one player brought a Hunter deck to the HCT Summer Championship. That player is China's OmegaZero. He has no card draw spells, with the closest option being Tracking. But he has enough troublemaking minions that he might be able to hang in there, in the event he doesn't draw the Death Knight. There's even an X-Factor play in the form of Bittertide Hydra. Although that might be a card to watch in itself, because the Hydra is just as capable of backfiring than anything else. Bonemare often has the potential to swing a game single-handedly. If there's another minion on the board, it turns it into a massive Taunt minion, while also threatening the board with its own 5/5 body. It's versatile enough that it can fit into just about any deck, but it has largely found a home in Rogue and Paladin decks. OmegaZero, Taiwan's Tom60229, and defending Hearthstone World Champion Pavel are among the Rogues that are carrying Bonemares, while Korea's Surrender and Mexico's Empanizado each have Paladins carrying the 7-cost minion. BaiZe and uya have also managed to squeeze Bonemares into their Keleseth Warlocks. 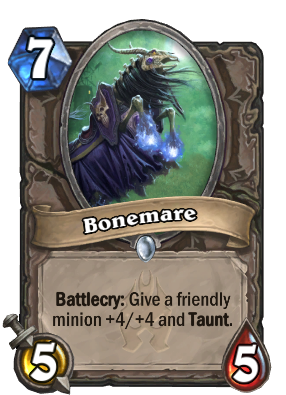 Bonemare's going to be a big-time minion to watch in matchups that drag out, where resources start to wane. It's enough to threaten lethal or ward off larger threats, like the ones presented by Jade Druids. Look for Bonemare to cement at least one matchup, especially for the Rogue, which has enough low-cost minions to make use of its effect. The Hearthstone Summer Championship 2017 is set to begin Friday at 8:30AM PT and is set to run the whole weekend. Prince Keleseth is good in rogue because they can afford to only run one two drop with their hero power on turn two being so common. I heard this same thing from Orange on the ride over to the Blizzard Arena. I was surprised when this card was first revealed, because I couldn't conceive a Rogue deck without Eviscerate. Oh you should ask people why keleseth appears in warlock zoo lists instead of Golakka Crawler. And it's a bit surprising there's only one player with aggro druid. That deck is very common on ladder. Oh god Ozzie I dusted the Prince based on your earlier article. I also crafted the Paladin Hero based on the same. It's a similar deal to the Rogue Quest, where it looked like garbage on paper, but wound up being the best card of Un'Goro (at the time). The Hearthstone analysis meta is a tough game to figure out in itself. yup, especially now that you don't get duplicates. if you dust it, you might pull it again, but if you keep it, you'll get some other legendary, and it might be useful in a couple further expansions.